These are my first attempts at korak-style piecing. 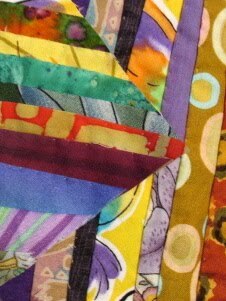 I'm sewing fabric fragments onto a background fabric by making folds in the cloth and pinning them down. 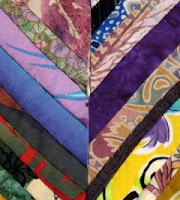 Each new piece is laid over the previous one and pinned and then hand-pieced. Eva gave me instructions to get me started and I plunged right in.....my usual tempo. But after a bit, I began to wonder what exactly defines korak piecing. Is it the folded-over- fabrics? Is it the style of the quilt? Perhaps they typically used folk art as a central motif or design element? What do modern era koraks look like? Eva, once again helpful, told me about Ruth Tschudy and shared this link with me where I got the following quote and description. The word «Korak» (meaning «patch») is today’s applied word of an old technique from Central Asia (mainly Turkistan, Uzbekistan and Afghanistan). Little literature is available on the subject, which is why Ruth Tschudy wrote a book about it, in which she explains the art and how to learn it. «Korak» will always be produced and sewed by hand. The most important materials are several and different parts of fabrics and cloths. You then need a pair of scissors, a ruler, an iron, a foxglove, and some pins. First then, you make a drawing and then create accordingly a template of the planned patchwork. 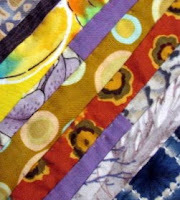 According to your puzzle, pieces of cloths will then be cut and pressed on to a basic surface of fabrics. 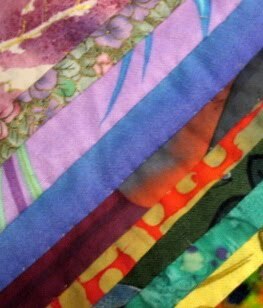 Then, each piece will be sewed together and your art is completed. The book features the variety of patchworks; accompanied by small stories and insights of the artist (this publication is both in German and English). And over here you will find excellent antique koraks. I received this link from Eva today and was thrilled and delighted to view these beautiful koraks online. Inspiring. For now, I am playing. With no clear thought of 'what my korak will be'. Looks great! I'm so curious how this will be continued! A very free way to apply the technique, and that's a good idea, because the traditional koraks tend to a certain monotony. I think yours looks great! How large do you intend it to be? thank you, eva. today i went back to ruth's website and look again at the koraks there under the link, 'patchwork'. there i discovered some very modern, very edgy art quilts. deborah, i don't yet know for sure. but when i looked at the older koraks on the link that eva sent me, i noticed it seemed somewhat traditional to use a central square or motif. so for now i'm thinking that what i am doing now will be a central block and perhaps about 9, 10 or 11 inches square. and then i will build from there. but i want this to be a smallist wallhanging. for now, i am enjoyed the 'playing'. thanks for looking at my korak attempts and for commenting. very helpful to my early process. thanks eva, i'll make the change. strange because i did a cut/paste from your email????? and the link in your email worked perfectly. A very interesting post Pat. I don't think I ever heard of the work Korak before. Just reading about it makes me want to slow down & try a bit. The antique pieces remind of a local artist, Susan Shapiro's work. She takes bits of antique textiles & combines them with her hand dyed fabrics, & turns them into quilts that look a lot like those you have linked to.